The Horace H. Rackham School of Graduate Studies Building is a 173,161 square foot structure that houses the University’s School of Graduate Studies. It is also a major facility for public events for the entire university community and the Ann Arbor arts community. William Kapp of Smith Hinchman & Grylis designed the building in the classical renaissance style during 1936 and construction was completed in 1938. The five-story building has exterior terraces at the second and fourth levels. The main interior spaces include a 1200-seat first floor auditorium, three large second floor study halls, third floor gallery spaces, and three significant conference spaces and 240-set amphitheater on the fourth level. 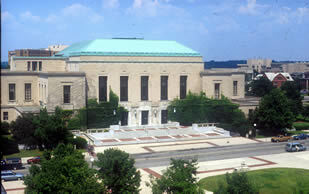 The planned renovation, restoration and rehabilitation of the Horace H. Rackham School of Graduate Studies Building has three basic goals: 1) improve the flexibility of the physical structure to assist Rackham in continuing its central role as the headquarters for graduate study (allowing easier programmatic changes in the future), 2) improve the infrastructure characteristics of the building to preserve the integrity of this architecturally and historically significant structure, and 3) improve the accessibility and safety of the building physically and electronically in its role of a link to the graduate programs, a focus center for outreach to the North campus graduate program and a vital link to the community.